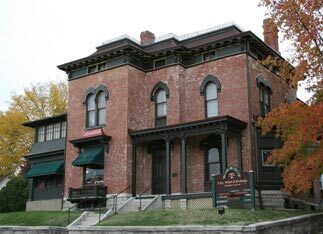 Welch & Hawk Estate Planning Center (a division of Cary, Welch, Hickman & Hawk, LLP) of Hannibal, Missouri, is located in the historic Ebert-Dulany building at 1000 Center Street. The building, a former lumber baron's residence, was acquired by the firm partners in 1982, at which time the building underwent a total renovation to the 1872 period in which it was built, using authentic period papers and fixtures. The building is listed on the National Register of Historic Places. Welch & Hawk Estate Planning Center of Hannibal, Missouri, provides highly customized living trusts, wills, living wills, general durable powers of attorney, health care powers of attorney, irrevocable trusts, design and creation of business entities (FLPs, LLCs, and corporations), business succession planning (including Buy-Sell agreements), asset protection planning, charitable trusts, will and trust administration, as well as individually designed asset protection for physicians, business owners and individuals.